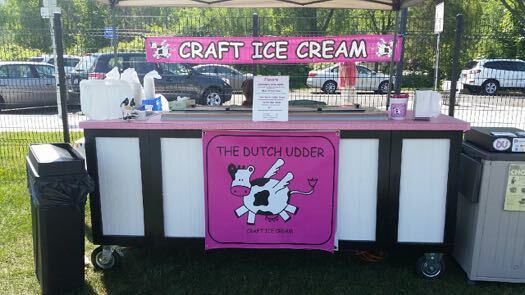 Today, we're checking in on the progress of the newly-opened ice cream business The Dutch Udder. We first met Kehmally Karl and Jeff McCauley they were finalists in last year's AOA Startup Grant contest. 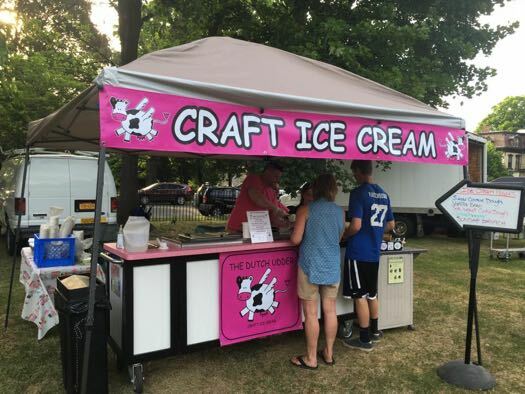 The Dutch Udder makes some delicious ice creams and sorbets out of interesting ingredients -- including local beer, wine, and cider. Kem, a nurse, and Jeff, who works in HVAC, started out by making ice cream for friends, who loved it. 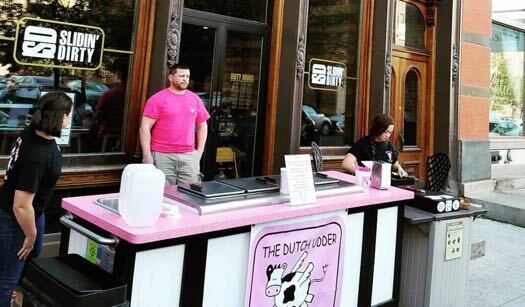 It's been a long road from that point to running a business, but The Dutch Udder has been officially open for two months. 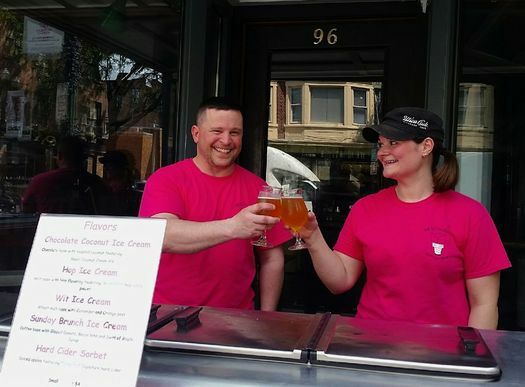 Now they bring their cart to places like Slidin' Dirty and Nine Pin Cider Works and to local events like Rockin' on the River, the Adirondack Wine Festival ,and the Sunday night concert series at Powers Park in Lansingburgh. We talked with Jeff about the road to opening up, and how things are going so far. So, how have things gone since you opened? We are completely fronted out of pocket and we have been going it alone -- we are not taking any business loans. So it's slow. Had we taken out a loan it would have been a much more fluid process, but since we are doing it out of pocket we fill the bank account and spend it and fill it and spend it. It's been a little easier because of my background in HVAC because we could do electrical and pluming and all of that ourselves had we hired someone to do it it would have been done but at what expense. One year ago we purchased a piece of property with a house on it and an in-law type house -- one bedroom with a kitchen and living room. 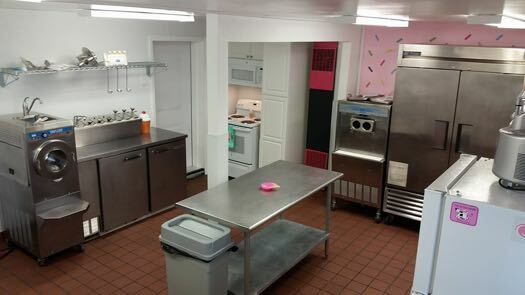 We renovated it and the second house is now a certified commercial kitchen. That changes everything for us. I don't have any overhead for rent for a commercial kitchen anymore. If a hinge-pin breaks and we have to shut down until we can repair it, then we're not losing rent money. We haven't quit our day jobs -- that is how we keep funding this in the first year or two. But having the ability to knock down walls is fantastic. We are just doing events right now. We would like a retail store but we don't want to rent. We'd prefer to own a building. Since we got all the construction done we are now able to get our commercial equipment up and produce a superior product. And the milk and ingredients are New York based and sourced and with that comes freshness and a lot of pride in the product. It's extremely satisfying to see people's reactions to the product. It makes you smile because you are having that type of impact in the community. What sorts of challenges have you encountered? Old equipment -- having to put it back together a lot. We are fortunate to have the ability to do so. A lot of our equipment is antiquated. Every piece of equipment is a hinge-pin and if it's gone, we can't operate. We are trying to update equipment now. Vendors' fees are a challenge. For Tulip Fest and festivals the fees are about $500, so you have to figure what our profit really is going to be for an event. Then there is insurance and workers comp. All these things add up. We've had complaints about our ice cream being too expensive at $3 a scoop. Then we go other places and they think it's a bargain at $4. It's hard to predict. Having enough product is a problem sometimes. We want to give customers an experience they have never had before, so we are still in a research and development phase. Some are winners and some are losers -- but even the losers use up product. We were challenged to do a Black Forest ice cream cake. Kem's challenge has been cherries. They are tough to work with. It cost us $150 for all that went into it and we ended up selling the cake for $20. But it was delicious, so it was worth it because it was R&D. She has officially conquered the cherry, so it was well worth the $150 investment. 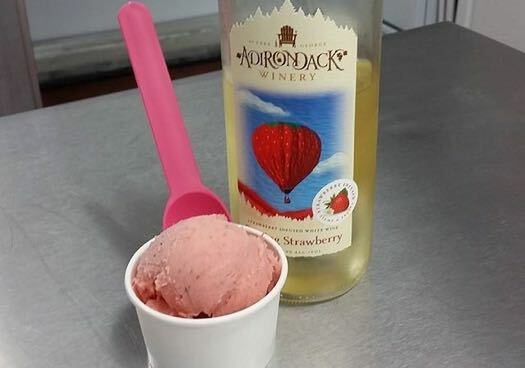 We were at the Adirondack Wine Festival last weekend and she sold through nine gallons of strawberry sorbet in one day. How do you know how much product to bring to an event the first time? It's so difficult to say. And weather plays a factor. What if it was 50 degrees or thunderstorms? That could change everything. We did an event for the Bike Barn [in Cohoes] our second weekend open and it was 50 degrees and we sold two ice creams. That's when Ed from the Bike Barn hands us $200 says, "Hey kids, free ice cream!" We appreciated that. Other local companies like Rare Form and Nine Pin are helping us out and boosting us up because we are a fledgeling company . Small businesses are hard to get off the ground when it comes to regulations. There is no consistency in departments in governments. They say check the internet and then you talk to someone and what they say is different than what is on the internet. You're dealing with the county and the city and the feds and all their restrictions and guidelines are not the same. There's a lot to iron out. Our first event was at Big Brew Day at Homebrew Emporium [in East Greenbush] . We were breaking in and figuring out how to do things -- even if we would need a step stool to reach the containers because we are so short. What is something that you have learned that you wouldn't have expected to learn? That everybody has a suggestion and that a lot of times they are contradictory to other people's suggestions. We were told at the AOA grant contest that we should not focus primarily on beer-centric ice cream. Then we went to Entrepreneur Boot Camp and were told we should only focus on beer centric ice cream. These knowledgeable people are telling us different things. So we have to take it all and think about the company and how to make it what we see it. You have to listen to everybody and take everybody's suggestions into consideration -- but it has to be our own vision. Not everybody has the same vision as you. Is there one particular frustration that you've faced that if you could just wipe that away, it would make a difference for you? The major problem is that we need somebody else to scoop the ice cream. We are getting to the point where we need someone else to do the hard labor. There are not enough hours in the day to do the R&D and make the ice cream and scoop it. It's exhausting. But we have to be the people interacting with the customers. We want to be that front end. We want to be the production people because we want quality control, but we also want to scoop it and have first hand feedback. It's hard to be both. The physical work is hard. I've broken three ice cream scoops already in two months. I've almost punched my self in the face. You need to get the ice cream down to temperature. It has to warm up to a scooping temp of five to ten degrees so if you bring it from the deep freeze at minus 20 you have to wait. Is there something that's happened to you, or some development, that's felt like a win? It's a double-edge sword. Yes, this past weekend [at the Adirondack Wine Festival] was great. We did more than ever before. But also Kem is exhausted. She feels like she has carpal tunnel in her wrist and she is wearing a brace. So I'm really concerned about not being able to handle it physically. When you do 100 scoops an hour you just beat the crap out of your wrist. Yeah, the festival was a great win, but we have to reassess how things are done. I was on military detail all weekend. If I wasn't, I might have been able to shoulder a lot of the scooping. It feels like a bit of a win and we look at the account growing, but we are putting it back into the business. We are still not taking a paycheck or any money from the business. 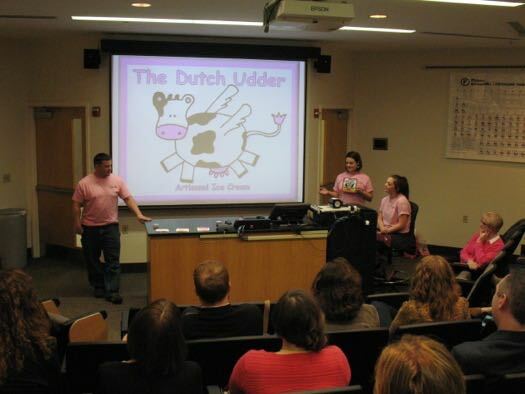 Seeing the Dutch Udder grow incrementally after every event is very encouraging especially after this past weekend. This is our vision, our dream, our possible retirement. To plant the seed and nurture it and watch it be requested at events is great. We have been asked by Sldin' Dirty to come in and we do every Rockin' on the River in front of their restaurant. We are requested for events at Nine Pin and Rare Form. That is kind of flattering to have other local businesses come and ask you to participate. Possibly a retail store depending on how this year goes. Someplace where we can do wholesaling and bulk sales. I don't think that will be immediate, possibly two to five years. Location is key. We don't want to just buy a place in the Albany Warehouse District and not have the foot traffic. We are still looking. Possibly a second cart and some employees. We are going slow we don't want to get too big too quickly. If I want to grow I have to do that. We can't hire people the first year. Our profit margin is very small because of the amount of money we put into the business and the product that we are selling. Our profit margin on a scoop of ice cream is very small. And if we're only making $200 we can't really afford to hire anyone. This past weekend at the Adirondack Wine Festival was an eye opener -- a record breaker for us. About three times more than we have ever made before. It goes to show us we have potential. If you knew what you know now, would you do it again? Yes. Without a doubt. It's Kehmally's dream and it's good for her to see the expression from her customers. She likes to make people smile and make them happy, and seeing her happy makes me happy. Would I do some things differently? Yes. But most of the changes we've made thus far have been positive ones. Their ice cream is fantastic! My boyfriend and I just tried it at the Troy Flea Market over the weekend. Loved the unique flavor combinations! We'll definitely be back for more! I wish Kem and Jeff the best of luck in their endeavors! Glad to see this family put in such effort to build a brand from scratch. Can't wait for their ribbon cutting later in the month. What flavors do you have, please? My faves are mocha dark choc chip & choc ~ choc chip.